They started it with the launch of Mozilla Firefox 2.0 and it then turned into a tradition. We are talking about Microsoft sending an Internet Explorer Cupcake to the Mozilla Firefox Team every time they release a new version. And yesterday too it was no different. The final version of Firefox 7 was released yesterday (September 27, 2011) via its FTP servers and will be soon launched officially. 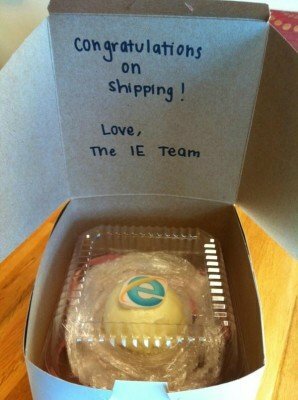 And keeping on with its tradition, Microsoft was prompt in gifting the Firefox team with an Internet Explorer cupcake and it’s actually very sweet of them, though Firefox 7 has not been launched officially by Mozilla. What caught our attention was the message written on the cupcake box. After observing carefully, you’ll make it out that it is the same person who has written the ‘Congratulatory Message’ on the cupcake cover during the launch of Firefox 5 and Firefox 6, and now Firefox 7. Pretty interesting! With the pace with which Firefox is progressing with its versions, we are quite confident that maybe, this particular well-wisher from Microsoft will actually write the ‘Congratulatory message’ on the cupcake’s cover till Firefox 15, or even maybe after that. The cups may be getting smaller, but Microsoft is always quick to send a cake over atleast. When will Mozilla reciprocate or atleast say a ‘Thank you’ for the cake? All good Firefox, but many have just started losing interest in Firefox! have had nothing but problems since around V5. I finally had to give up and move to Chrome. I tried V7 and the same problems persist. I hangs randomly on some pages never loading them at all until I retry or refresh and some images just fail to load randomly especially in gmail. I totally giveup. It’s been all downhill since V3.6 for me and I love(d) FF. I’m surprised for the wave of bad reviews and bad comments about Firefox in the present.